Free SMS stands for Free short message service. SMS service is one of the easiest way to transfer your information to other person. Free SMS service for NTC SMS service and NCELL SMS service is easy. Here, we will discuss about free sms service provided by both telecom networks of Nepal. Sometimes you may be busy in meeting or you are in class or the place where you can’t receive other’s phone,the phone may be important but you can’t receive then at the time you can let that person know that you are busy or can’t receive phone through help of SMS.� If we are in public and have to do secret talks then we can conversation through SMS. 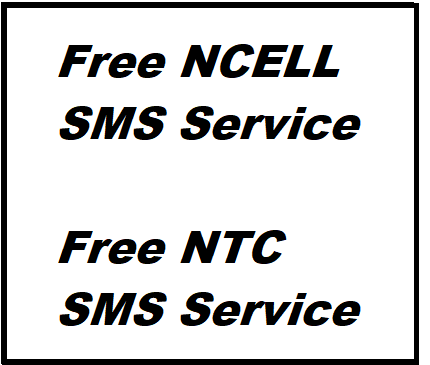 There are different way to send SMS or activate free SMS service the way in two different sim are NCELL and NTC. Nepal Telecom is one of the leading communication organizations in Nepal. It has recently launched the social networking platform MEET with an Investment of 10 Cores which allows the users permits to Free SMS, pictures, audio and video. Telecom’s subscribers can log on to the social Networking site�Meet�directly through the website. You can also use MEET�app�in your�smartphone�on android and iOS platform. For that, the users must use valid GSM or CDMA phone numbers for registration. For sign up, the Meet process is so easy. Open the browser and type the Meetup address. Fill all the details like Display Name, email, mobile number, username, and password. But remember while putting the password it is must type at least 1 upper case letter. After that, you will be sent an activation code to your mobile by the system. After entering the code in the browser you are ready to send free SMS and more. �The SMS you get can be send from one NTC sim to another NTC sim only� I.e.� NTC to NTC only. For free NTC SMS service, you ned to use online system callet Meet at meet.net.np. At first go to Ncell�official site�and click on link E-Care or click�HERE�to go directly to ecare portal. Now you will get this form with different fields. Fill the fields with details as� MDN i.e. �Your 10 digit Mobile Number, Password or we can say �your �ecare password, Verification Code,�The four digit at the right side of the field. It should� be register first , In case you have not registered your Ncell number for ecare portal, go to�Activate your ecare account�link at the left of the login form or directly click�HERE�to register, then you can enjoy services. Fill up the registration form with your mobile number and choose the certificate type that you used at the time of sim card registration. The verification certificate could be passport, citizenship, driving license, brunei ID, Civil affairs ID, student ID or other as you used at the beginning. Then click on�validate the customer info�and you will get verification details on your mobile number. After registration,�login�as specified above which lands on the page below. �After that click on�Business Info Maintain, �Now click on�Send SMS�to send free SMS to any Ncell number which is �free of cost. Finally, you will get the page to send SMS with 3 empty fields. Type the mobile number to which you want to send message at�Phone Number�field, maximum of 160 character message on the next one and leave the third field�Sending Deadline�as it is if you want the SMS be sent instantly. �Otherwise schedule the sending time. You can send maximum of 10 messages per day for free of charge which is possible for Ncell to Ncell sim only . For free NCELL SMS service, you can use Ecare.